This post was created in partnership with Mirum Shopper and FitFluential but all the opinions expressed here are 100% my own. Do you ever have those days that just fly right by and before you know it, you're putting your littles to bed and wondering where did the day go? That would definitely give you a very clear picture about how my days have been since school started. Work, soccer, dance, marathon training, homework.... LIFE! It's crazy. I know I definitely bring it on myself. Some mornings, I rush around so fast, I forget my deodorant! GAH! That shower fresh feeling doesn't exactly last very long in a stuffy classroom. That's for sure. I always have a spare deodorant (or two) in my desk drawer. I would hate to be that smelly teacher! But with that said, deodorant is definitely a huge part of my morning routine. But there are times that I'm rushing so fast, I get white stuff all over my black shirt. And then I don't notice until lunch time, when it's too late, and I've already taught 60 kids, who are probably making fun of Mrs. Boudreau. So I did a little digging on Walgreens.com/DoDeoBetter and found that Dove dry spray option! I've got to tell you, it's SO much better. Just spray and go. Simple. And I love simple! 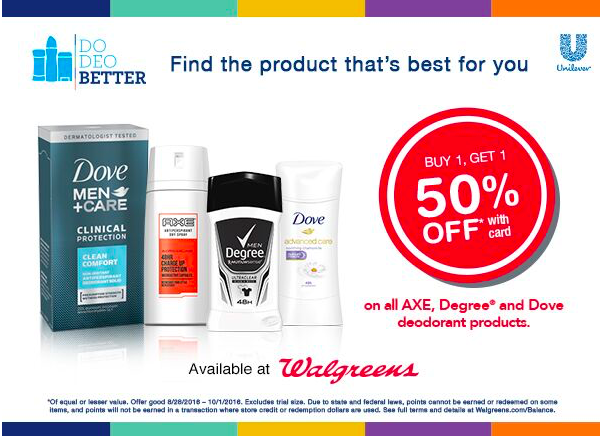 If you're curious to see what deodorant is best for you, head over to Walgreens to see which is right for you. There are actually 4 categories of deodorants. Yes, there seriously are. I never knew that! Dry Sprays that go on instantly dry. Care care's for your skin, with moisturizers and such. Motion Activated which will protect you for 48 hours with MotionSense® technology. Then Clinical Protection for those who require clinical strength wetness protection. For this week only (9/25 - 10/1), if you buy 2, you get 1,000 points AND buy 1, get 50% off. 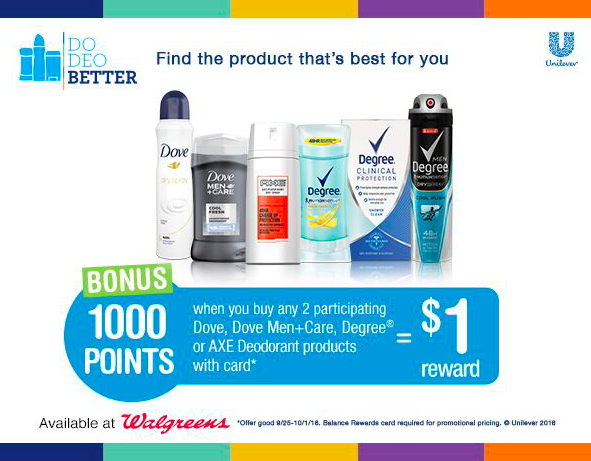 Of course, you'll need to have your Walgreens Balance Rewards Card handy to get those points and receive the promotional pricing! PS, I lost my card, but the key pad gives me the option to type in my phone number so I can still rack up those points and save money! Tell me, what do you prefer? Care? Dry Spray? Clinical? MotionSense® or do you like to have a variety? I love a variety for all possible scenarios! And I like to toss some wipes in there too.